Two weeks ago, a team led by scientists from Northeastern University published a study describing a new class of antibiotics called teixobactin, which they found in the soil of a field in Maine. The Internet subsequently lit up with both excitement and criticism (mostly excitement, though). It’s the first new antibiotic in a long time, though just how long depends on how you define various antibiotics classes. Details on the timing of the lag in antibiotic discovery aside, that lag is real and is definitely a problem. The new findings are great news, particularly as we face a global antibiotic resistance crisis that could kill 10 million people each year by 2050. Teixobactin will have to go through years of testing to be proven safe and effective, of course, but it’s still a start. Most media coverage of the new study has focused on the unique characteristics of teixobactin that make it a particularly intriguing drug candidate, including the claim that it may be unusually apt at thwarting bacterial resistance (this is where some of the criticism comes in, since bacteria usually do eventually find a way). But what I found even more interesting than the teixobactin discovery—which other writers have also pointed out—was how the researchers were able to find it. They developed a device called an iChip, which allows scientists to explore the virtually untapped wilds of bacteria for potential antibiotics and other interesting unknown chemicals. And the iChip may be a boon not just for antibiotics discovery, but for finding other types of drugs as well as potential energy sources. Really, any industry that looks to microbes for novel chemicals and inspiration may benefit from the technology. Let’s back up a little bit. For the past century or so, the technique to grow bacteria in the lab has remained pretty much the same: take a sample from, say, soil, marsh water, or some other potential source; mix in water; detach the bacteria from the other particles, perhaps by spinning it in a centrifuge; and smear the isolated bacteria on a nutrient-laced agar plate, usually contained in a petri dish. Then let the bacteria multiple. The trouble is, an estimated 99 percent of bacterial species refuse to grow under these conditions. This is called the Great Plate Count Anomaly, and it refers to the number of bacterial colonies in an environmental sample compared to those that survive on an agar plate. The inability to grow most microbes in the lab means researchers haven’t been able to study them, which in turn means we’re missing out on all the chemicals that these tiny critters use to navigate their environment. Some of these chemicals have antimicrobial properties, which the bacteria may use to kill competitors or other threatening microbes, and they could potentially be synthesized to make antibiotics for people and animals. Around 15 years ago, Epstein and his colleague at Northeastern, microbiologist Kim Lewis, starting toying with a new approach to this problem. The natural environment teems with bacteria, which suggested to the researchers that this environment holds key ingredients that hadn’t yet been discovered, let alone replicated in the lab. Maybe these molecules are nutrients or growth factors, or maybe they provide signals that trigger bacteria to grow at just the right moment. Maybe they are something else entirely. But the researchers didn’t need to know exactly what those components were in order to put them to work. Rather than pull bacteria from their natural setting and coax them to grow in a coarse approximation in the lab, why not simply bring the whole environment to the lab, mystery molecules an all? Next, the team, along with a graduate student named Tammi Kaeberlein, developed a diffusion chamber, which sandwiched bacterial samples between a breathable material with pores that were big enough to let nutrients in and waste out, but small enough to contain the bacteria. The scientists collected some of the bacteria’s natural environment—in this case, marine sediment—and set the chamber in that environment in the lab. It worked. The device allowed them to grow 30,000% more bacterial colonies compared to an agar plate, and the team published the findings in 2002. The only problem was that the chamber didn’t isolate a specific bacterial strain, but included many species at once (it’s worth noting that other scientists have come up with similar approaches. The next step was to build a device that could isolate individual bacterial cells and allow them to grow. With help from Dominica Nichols, who was both a PhD student and post-doc in Epstein’s lab, Emil Trakhtenberg, an engineer at Argonne National Lab, and a team of technicians, Epstein ultimately figured out a way to cultivate dozens of samples simultaneously—a high-throughput method to identify and grow new-to-science microbial species. 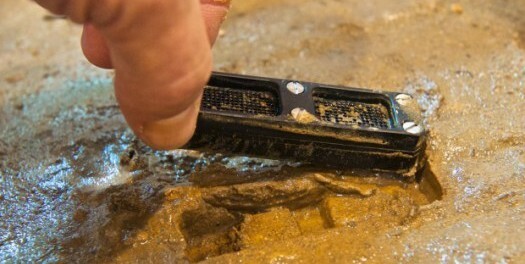 This ultimately became the iChip, a hard piece of plastic with 192 tiny wells. A researcher simply has to dip the chip in a bacterial sample mixed with agar to trap cells in each well, secure diffusion membranes to lock the sample inside, then put the entire thing into a larger sample from its natural environment. Each cell becomes a miniature diffusion chamber. According to Nichols, the team successfully grew microbes from a wide range of sources, including saliva, salt marsh, wastewater bioreactors, and mud collected from a temperate California rainforest. The team published the proof-of-concept of the iChip in 2010. As the technology advances, there may be a chance to collect microbes remotely—maybe even from other planets, or deep ocean trenches, says Epstein. His lab is working on a new chip that cuts out the middle steps required to isolate the bacteria, as well as teasing out the environmental mystery molecules that allow unculturable species to flourish. This is all exciting, but it probably doesn’t mean the end of the antibiotics crises. Any new antibiotic will need to go through strenuous testing. Some will prove too toxic for humans to handle, and others won’t work against our most serious infections. Even the best candidates will take a long time to make it through clinical trials, which doesn’t help people who currently suffer from untreatable infections. And those compounds that make it through testing will still require careful stewardship, lest we squander those like we have our current antibiotic stock (while Lewis argues that the teixobactin is impervious to resistance, it is still a possibility).